What’s The Point Of Having An Ideal Client? But why? What’s the point? That is what this blog series is all about, after all! You may feel like you should market to everyone and anyone with a pulse and a credit card, and that makes sense if you’re trying to reach the maximum amount of human beings. The problem is, you don’t have the money to market to everyone and even if you did, you’re not for everyone. Even Apple has haters. It may seem counter-intuitive, but your marketing should focus only on the people who are most likely to make a purchase from you. You can’t be a perfect fit for everyone, and by trying to do so you’re flushing your marketing budget and your time down the toilet. When you how to narrow your focus you actually save money and attract better clients. If you had a heart attack, would you rather see a cardiologist or a general practitioner? And would you rather see a random local cardiologist or one who has a lot of experience with patients who have had heart attacks? Cardiologists aren’t for everyone, but they are in demand by patients who fit their target market and tend to be paid significantly more than general practitioners are. You can’t be everything to everyone, you have to focus. I promise you this will make your life a LOT easier. Is your 30-year old a Walmart shopper or would she never be caught dead there? Is your 30-year old covered in tattoos and loves artistic creative things or is she straight-laced and thinks tattoos are gross? Does she value tradition or is she obsessed with everything on Offbeat Bride because she loves going against tradition? You see, people aren’t demographics. There are a LOT of different types of 20-35 year old women who don’t have time to plan their wedding and you can’t market to all of them. You need a target to aim at. Why do the answers to these questions matter? Because your ideal client is a whole person, not just a bride or a groom, and their values directly influence their consumer behavior. The key to marketing effectively is understanding those values that your ideal client holds and using them in your marketing. Because that brand makes you feel good and secure knowing that what you buy is safe for your and your family, was made fair trade and came via their green distribution centers. Whole Foods gets you and your values and they market to you using those values. Most wedding professionals are far too vague in defining who their ideal client is. Get to a point where you can describe them like you would describe a friend of yours to someone who you think would be a great boyfriend or girlfriend for them. You wouldn’t describe them as being 20-35 and busy. That’s not what matters in that case and it’s not what matters in your business either. I challenge you to go deeper. So what are you supposed to do from here? You do what almost no one does. You listen. You can’t just assume you know what your ideal client wants, needs, cares about, etc. You have to test those assumptions and the best way to test them is to actually talk to your ideal client (a past client you just LOVE or someone who you think fits that profile) and listen. 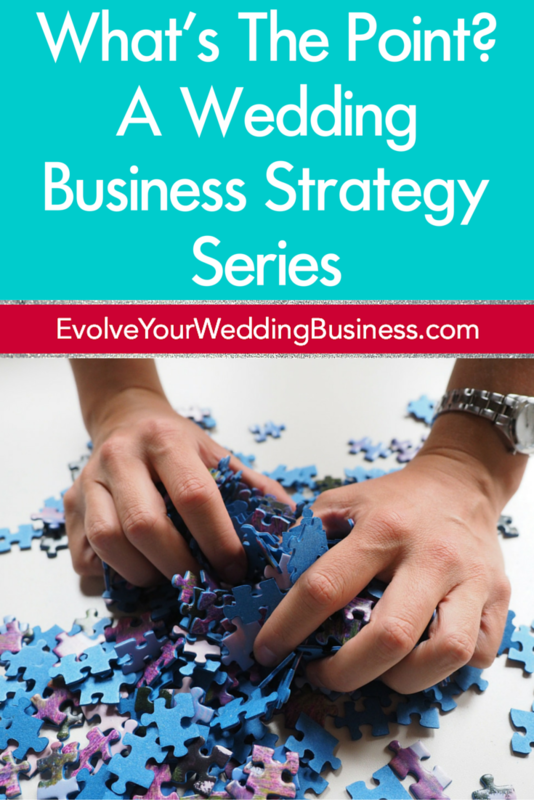 This is a process I take members of The Wedding Business Collective through and I’m giving you access to it too. All you have to do is click here and you can get access the webinar replay where I walk you through this process and the guide to interviewing your ideal client that I ripped directly from The Wedding Business Collective. Get it here, all totally free. If you’re just another wedding planner of photographer in your city then couples are going to compare you to everyone else. Now, if you’re the go-to photographer for tattoo-loving couples who read Offbeat Bride and give the middle finger to tradition or the go-to planner for couples who are Americans, often the children of immigrants, and they really value their Hispanic heritage and they want to incorporate that part of their identity into their wedding, you put yourself in your own category. Suddenly you’re not just a photographer or just a planner. You’re the clear best choice for your ideal client. There’s the vanilla that is everyone else, and then there’s you. The goal here is to avoid making yourself a commodity. Think about this: What brand of sugar do you buy? Do you fill up your car at the closest gas station or do you seek out a particular brand? When you moved into your home, did you choose your utility providers based on price comparison? All of these are commodities. It’s easy to compare them based on price because there is no real differentiating factor. If you are not emphasizing why someone should hire you over someone else and if you don’t understand the value you deliver to your customers and what they actually care about, you’re allowing yourself to become a commodity. They don’t know what else to ask you because you haven’t built any connection or demonstrated your value to them. Humans compare things – it’s in our nature. When all people have to compare is price, the person who is undercutting you will win. So who do you want to be the go-to person for? Talk to that person and only that person in your marketing and everything that you do and you will attract those perfect clients. Do you see why your ideal client is so important? All of the marketing in the world can’t fix the lack of understanding your ideal client. Who they are and what they value drive EVERYTHING from the words and images you use on your site, to what you post on social media to how you work with them. Don’t build your business without a foundation. Don’t skip this part. If you do nothing else, reach out to a few of those perfect clients you’ve had and ask them some questions. Not sure what to ask? Click here and you can get access the webinar replay where I walk you through this process and give you the guide to interviewing your ideal client that I ripped directly from The Wedding Business Collective. Get it here, all totally free. Fill out the form and you'll get each post delivered directly to your inbox so you don't miss a single one! You're in! You'll get an email when the next post in this series comes out.